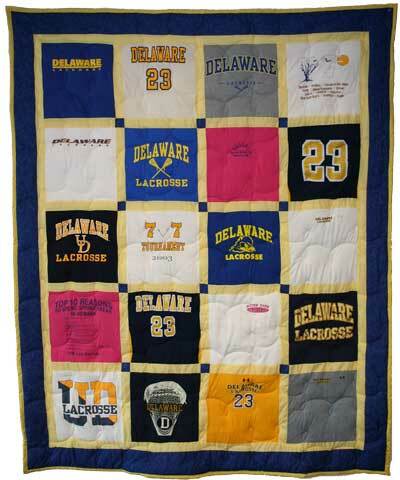 T-shirt Quilts are made from your treasured shirts. But, they don't just have to be t-shirts. You can use sweatshirts, ties, socks, baby clothes... almost any fabric you can dream up. Making a t-shirt quilt with Brightside is simple. Just place your order online or by phone. We will mail you a pre-paid shipping label and instructions to package up your t-shirts. We take care of all the rest. A standard quilt includes your t-shirts, strips of fabric between each square, and full crazy quilting on the entire quilt (not just hand tying in the corners of each t-shirt). You can also have several additional options added to your quilt for a little more. Brightside quilters have over 50 years of sewing and quilting experience. We take great care in making sure that your quilt is beautiful and will last for years. Please call us today to start your quilt. Your company offers a wonderful service. Thank you so much! It looks amazing on my bed. I love my quilt. The quality is far past my expectations.